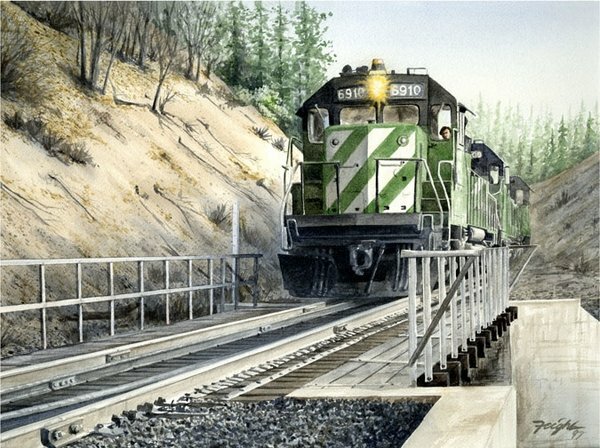 These green and white diesels of the old Burlington Northern Railroad are shown passing through a cut just after crossing the Kiddie Wye in the Feather River Canyon, California. In 1996, the Burlington Northern Railroad merged with the Atchison, Topeka and Santa Fe Railway to form the Burlington Northern and Santa FE Railway and the green/white BN paint scheme shown in this painting was replaced with the bright new BNSF livery. including a 2" white border.